The “HALL OF FAME” UKE was designed in collaboration with Paul Syphers, director of the Ukulele Hall of Fame Museum. 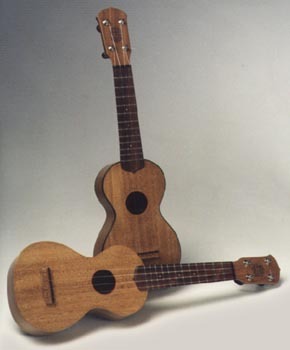 The body is distinctly Hawaiian in shape, and the headstock is inspired by several historic ukes in the Museum’s collection. The “modern” 13 5/8″ scale length and lightweight mahogany body create surprising volume and a warm, bright tone. The Museum logo appears on the headstock and the soundhole is highlighted with a red veneer binding. With a rosewood fingerboard, ebony nut and saddle, and Grover tuners, the “HALL OF FAME” UKE is available unbound (Style O) or with traditional “tortoise shell” binding and black/white purfling (Style 1). Also available in koa. A portion of the sale price goes to support the work of the Ukulele Hall of Fame Museum.